Barn Hill Residents' Association (BHRA©) was established in 1988. It is voluntary and non-political. We invite all residents to join the Association. The area covered by BHRA is shown on our map. Barn Hill Estate is a green and pleasant place in Wembley, part of the Borough of Brent, in Middlesex, England. The hill is 86 metres (282 feet) at its highest point, tall by London standards as much of the conurbation is flat. Read more about the Flora and Fauna of Barn Hill. The crest of Barn Hill forms part of the 103 hectare (260 acre) Fryent Country Park. From several points on the hill the views are rural in character. As well as the city and other developed areas in the distance, there are vistas of the park's woodland, ponds and large meadows with ancient hedges. To the west lies Harrow-on-the-Hill, in the east is the nearby Welsh Harp Reservoir with its yachts and wild fowl, and to the north can be seen the green belt where Greater London gives way to the Hertfordshire countryside. All Barn Hill houses are within easy reach of the park and several adjoin or face it. Below the estate is Wembley Park Station, which also serves Wembley Stadium, further to the south. The Stadium is London's premier venue for international soccer and world famous concerts. Over the new stadium is a huge arch that has become a regional landmark. The arch is even more widely visible when lit up at night. Barn Hill lends its name to a district that elects three Brent councillors but Barnhill Ward also includes areas beyond the Estate. Information on walks that include Barn Hill and Fryent Country Park. 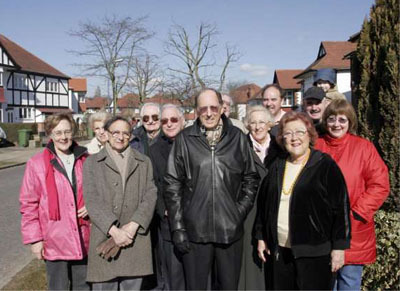 A new constitution was adopted at the Barn Hill Residents' Association Annual General Meeting on 18th May 2005. It comes as a surprise to many walkers taking the Capital Ring walk to see a semi-rural area in Wembley abundant with much flora and fauna. At the top of the Hill is the pond with Mallards, Moorhens, the occasional Teal, frogs and Toads. The resident crows make the sky seem black when circling overhead but then a splash of green appears with the Parakeets pass by. For the last few years they have made their homes in the tall trees. There are Magpies, Wood Pigeons, Starlings, Collared Doves, Blackbirds, Thrushes including the Mistle Thrush, Woodpeckers, Robins, Wrens and if you are luck enough to go up the Hill at twilight you can hear a Hoot Hoot from the two types of Owls that live in the local trees, the Barn Owl and the Tawny Owl. Many of the hedgerows that separate the fields date back hundreds of years. They look spectacular when in bloom. There are many types of trees, bushes, shrubs with some bearing fruit in the summer which not only helps to feed the animals and birds but the humans as well. Many of the trees are enormous, stretching high into the sky. One of the tallest trees lost its nesting box this year, but hopefully the pair of Kestrels who come each year will find a suitable place to nest this yea, which will allow residents the see the parents teaching the young to swoop. There are Hedgehogs, Bats and Foxes, who are classed as urban foxes as they live on food left out in the bins or on leftover food. They also eat small rodents and birds; sometimes people become worried when they hear a screaming noise at night - it sounds if there is a cat fight, but its ok, no one is being hurt – it’s the Foxes “talking”. Barn Hill is abundant with flowers (look out for the Bluebells), trees, animals and birds. They need to be protected so that future generations can see them too. It’s not difficult to see the beauty around us on the Hill, all you need to do is take a walk and look.